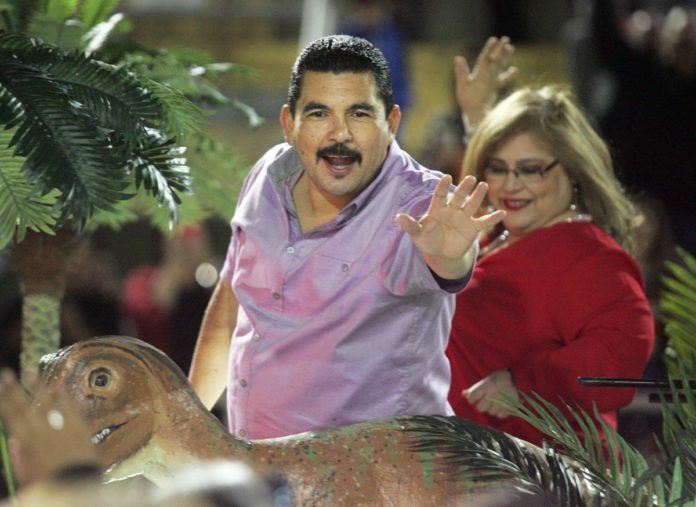 Television personality Guillermo Rodriguez waves to the crowd during the McAllen Holiday Parade at McAllen Veterans Memorial Stadium on December 5, 2015 in McAllen. Rodriguez also participated in this year's parade. Video clips from the annual McAllen Holiday Parade were featured on ABC’s “Jimmy Kimmel Live!” Monday night as guest host Chris Pratt joked with show regular Guillermo Rodriguez. “Have they started calling your cage an ornament?,” said Pratt, referring to Rodriguez’s float. The video showed a short portion of the parade broadcast where Rodriguez waved to spectators seated in the McAllen Veterans Memorial Stadium. This was Rodriguez’s second year featured in the mile and a half illuminated parade. The city said he was asked back because of popular demand. The parade’s grand marshal was former Dallas Cowboy Tony Dorsett and featured other Cowboys players, including Tony Hill, DeMarcus “Tank” Lawrence and Ryan Switzer, the Dallas Cowboys cheerleaders and their mascot Rowdy. Other celebrities included television personalities like Dra. Ana Maria Polo from Telemundo, Karina Banda and Julian Gil from Univision, and Rio Grande Valley natives and now child actors Manelly Zepeda and Noel Carabaza.